Cured Meat, Smoked Fish & Pickled Eggs – New Cookbook – Available Now! Easy to grab and satisfying to eat, preserved proteins go way beyond jerky. In this new cookbook from food preservation teacher and cook Karen Solomon, you’ll learn how to smoke, pickle, salt-cure, oil-cure, and dehydrate a variety of meats, dairy, fish, eggs, and other proteins economically and at home. Fifty-six creative recipes highlight what you can make yourself, including smoked salmon, pickled beans, cured sardines, brined cheese, duck breast prosciutto, and, of course, beef jerky (eight varieties!). In “Cured Meat, Smoked Fish and Pickled Eggs,” Karen Solomon offers new ideas for everyday foods. Karen Solomon’s latest book is not one you need for putting up batches of bread and butter pickles, peach preserves or tomato sauce. The author, an expert on pickling and preserving, addresses how to add new flavor and shelf life to ingredients that know no season: meats, poultry, fish, eggs, dairy, nuts and beans. I liked the variations she suggests, and cross-references she gives when it comes to methods. She offers details like timing, yields, storage and uses. Her recipe for rousong (a.k.a. pork floss) — a fluffy kind of pork topping like fried pulled pork — is a keeper. 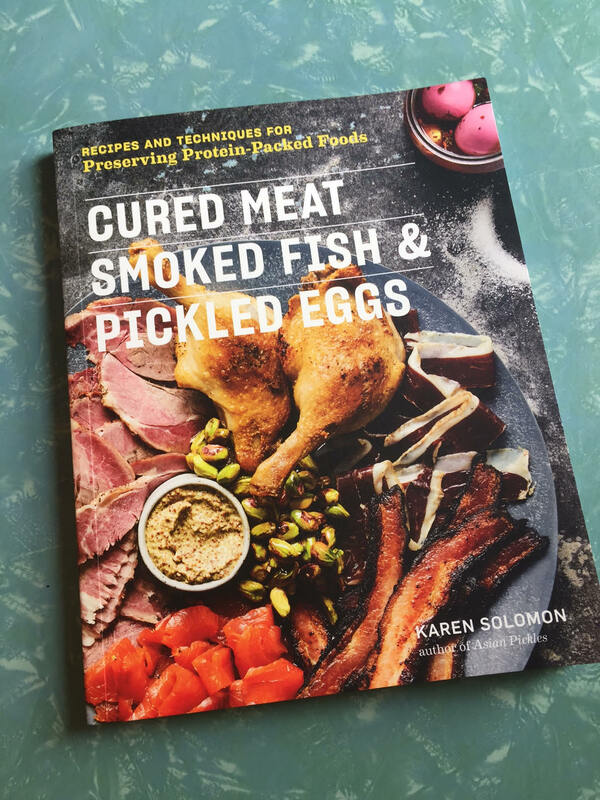 “Cured Meat, Smoked Fish and Pickled Eggs,” by Karen Solomon ($19.95, Storey).